Doug Stewart, our local SEO expert, was born at Hillcrest Hospital in Tulsa, OK. He studied computer programming at Tulsa Community College and Business Management at The University of Tulsa. He also studied advertising and technical writing at The University of North Texas. Before there was a Google, Doug worked to get his clients to the top of Alta Vista, Excite, GoTo, Ask Jeeves and Dogpile. “Back-in-the-day” Doug built websites with Microsoft’s Frontpage and hand-coded HTML to get websites to the top of the search engines. Until DSC Web Services and its clients outgrew Microsoft Frontpage. Then we hired two developers, TJ Stewart and Jason Morris. With TJ and Jason’s help, we built a search engine friendly e-commerce platform, Fast Cat Carts. Today DSC Web Services builds websites and performs search engine work primarily on the WordPress CMS. Doug also teaches local SEO basics using WordPress at WordCamps and other conferences (see below). Want to get started with Local SEO help? Click on the button below . . .
First, we look at where you're listed on Google now. What keywords are you ranking for? How do you stack up to your competition? Then we create an action plan and get to work. We get quick wins where we can. We prioritize work by potential profits and by your company strengths. Our local SEO specialists find out what keywords people in your industry are paying the most on Google to advertise. Then we improve your current web pages and build new web pages that get high search engine rankings for those keywords. We also find out which keywords are getting the most traffic or clicks. And we build web pages to get high search engine rankings for those keywords too. The data in the chart above is from SpyFu. It’s for one of our clients after 1 year of search engine work. We started an SEO campaign for them in October 2017. 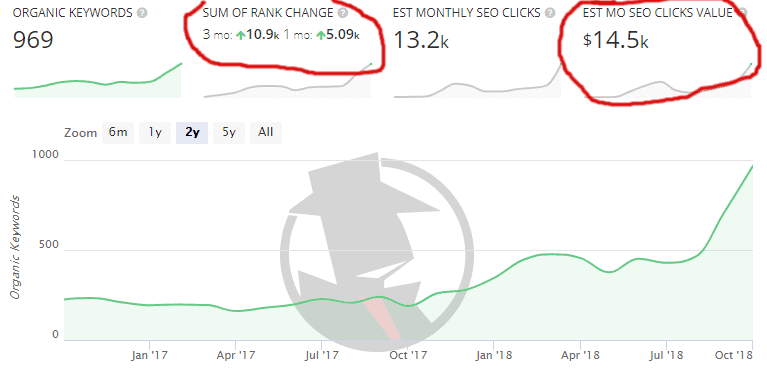 As you can see, SpyFu estimates their search engine rankings would cost approximately $14,500 per month if they paid Google advertising for the traffic. Why Would an SEO Consultant Recommend This? Because if you own the highest valued real estate on Google, you’ll get the lion’s share of the best phone calls. Phone calls from people ready-to-buy. People looking online for your products or services find you. They call you. You get the best phone calls BEFORE they start calling your competitors. Be the first in line at the feeding trough. When you invest in owning the best online real estate, you start automatically winning the sweetest projects. The best deals come your way first. In August 2015, Google changed the number of companies listed in the local pack from 7 to 3. This is just one change of many that have reduced the number of companies listed on Googles' first page. 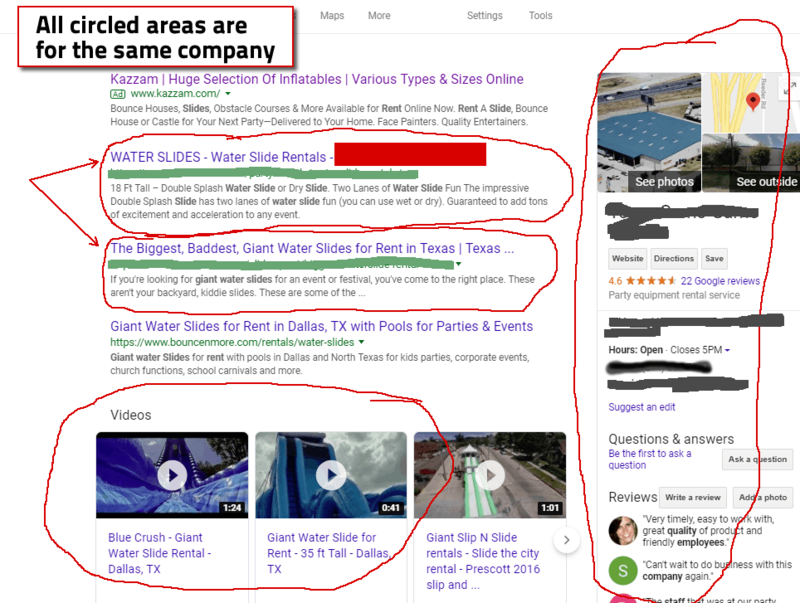 In 2018, Google added a "carousel" of videos to many searches. This made it easier for smart companies to get more exposure on Google's first page results. We believe our clients are our partners. That's why we only work with one business in a category for any region. We work hard to help our clients win the lion's share of the business in their region. We want our clients to be the category king in their town. We do our best to follow the rules and stay away from short-term Google exploits. Which means some of our work can take time. SEO is an investment. Not a quick shot of sugar and caffeine, that gives a quick burst of energy and disappears after 30 minutes. We're in it for the long haul. That's why our clients stay with us for a long time. The only money back guarantee that I know of in the SEO industtry. 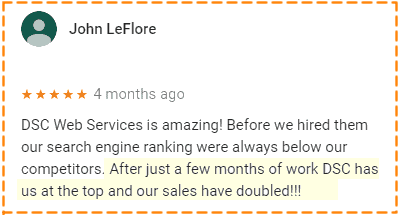 After working with us for 12 months, you will own the best Google rankings for the highest estimated value keywords in your industry locally. What that means is you will own the website with the best, most expensive rankings when compared to your local competitors. To get started, click on the button below and see what a custom roadmap or playbook for increasing your website's local SEO rankings looks like. In 1998 Doug Stewart, SEO consultant, sold printers for an IBM Business Partner. When the company needed more leads, Doug built a website and got it to the top of the search engines for them. The IBM Business partner became the first client for DSC Web Services, Inc.
For more about how the company began, click here. Tulsa Technology Center hired Doug Stewart to teach a class for local business owners on getting found on the web. The class was a two-day class covering search engine optimization basics. It was taught at the Tulsa Tech - Lemley Memorial Campus. This class is no longer available. Should you pay for Yoast premium or the Yoast Local SEO plugin? Is it worth it? Do I need to learn schema markup? What are some common mistakes that could get you kicked out of local searches on Google? After this talk, you’ll be able to confidently increase your website’s visibility on Google local searches using a WordPress powered website. Or become more knowledgeable when hiring an SEO consultant. You get a custom guide, a "road map," for your business with specific steps guaranteed to get you better search engine rankings. Researched specifically for you by an SEO professional. You can either go through the guide yourself and take these actions or you can hire someone to do it for you. Either way, you are guaranteed to get better search engine rankings. Who Will This Help the Most? 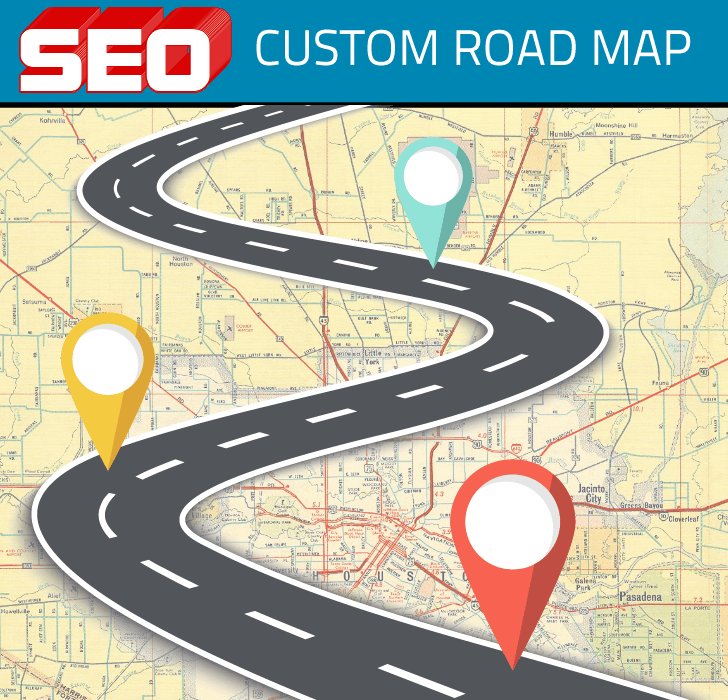 To find out more about the Custom SEO Road Map, click on the button below.